Ahhhh, Summer. It’s finally here for real, sunburns, mosquitoes and all. And this salad is absolutely perfect for the scorching days where you can’t even think about warm food. Incidentally, it’s also perfect for inspiring memories of these sweltering days in the dead of winter. 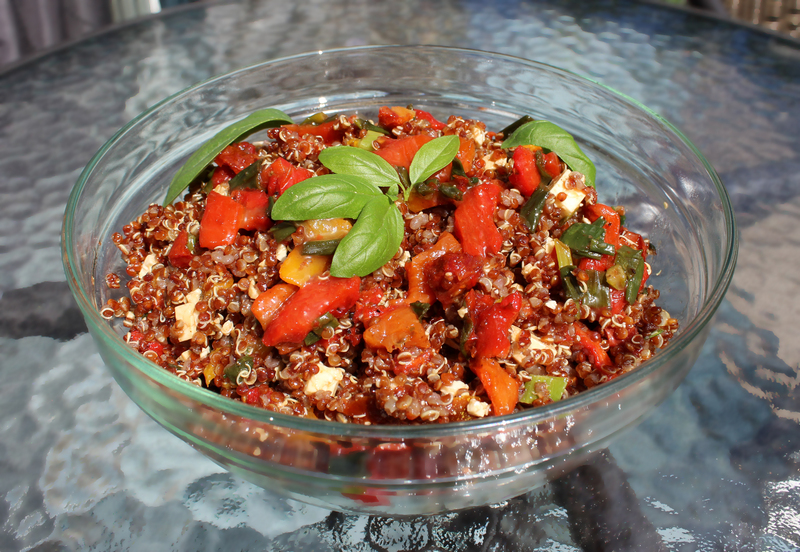 It’s also pretty good for you – chock full of veggies, good fats and the relatively high protein pseudo-grain: quinoa. If you haven’t had it before, you should try it. The texture is a little unusual – it kind of pops in your mouth, and it has a subtle earthy, nutty taste. It’s a good gluten-free substitute for couscous, or a nice change from rice. This dish is easily made vegan by removing or substituting the feta. Cook quinoa according to package directions. It will need to cool as well, so feel free to do this step ahead of time. The quinoa will keep in the fridge until you’re ready to use it just fine. In a largeish bowl, combine the remaining ingredients except the green onions. Warm a frying pan to medium high, and add a splash of the oil of your choice. Add the green onions and a generous pinch of salt, and sauté until they just start to brown. Do not leave them, this will happen quickly, and they must not burn. Remove from heat immediately and add to bowl. Add the cooled quinoa to the bowl, and mix thoroughly. Add salt and pepper to taste. If you’re letting it sit for a while, add an extra splash of olive oil before you serve it. Garnish with fresh basil. This entry was posted in Italian, Salad, Vegan, Vegetarian and tagged Quinoa, quinoa recipe, quinoa salad, recipe, roasted vegetables, sicilian, sicilian quinoa salad, sicilian salad, summer food, vegetarian. Bookmark the permalink.